Sean has over 25 years’ experience in land use planning and project management. Sean concentrates on environmental permitting and zoning, working directly with the clients and reviewing agencies to secure construction and subdivision approvals. Sean has also done significant expert witness testimony related to condemnation and civil cases regarding land use matters. 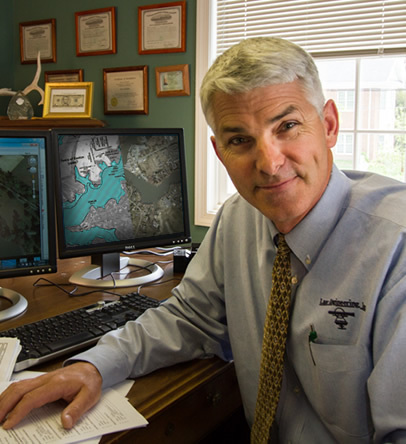 His specialties are projects related to Chesapeake Bay Critical Areas, tidal and non-tidal wetlands, forestry, and mining. Sean is a Maryland Qualified Professional under the Forest Conservation Act and he is listed as a qualified contractor for wetland delineation services by the Maryland Department of the Environment. As the Cambridge Branch Manager, Sean takes the lead role on projects in Dorchester County. Sean graduated from Salisbury State University with a degree in Geography and Regional Planning and has past work experience that includes public sector work as the Zoning Administrator for Talbot County. Sean is a resident of Oxford, Maryland.